It is easy to accidentally close a tab in Mozilla Firefox; and, depending on your startup settings, Firefox may not automatically restore all the websites you last visited if you accidentally close the entire web browser window. But Firefox fortunately includes a functionality that allows you to reopen the last closed tab at any point (an "Undo Close Tab" command), reopen select closed tabs, or even reopen all tabs you closed in this session (the time since you launched Firefox) - let's get started. Before we go any further, note that this functionality does not work across sessions: in other words, Firefox will keep track of the closed tabs listing since you last launched Firefox, not before that. So, let's say that you accidentally closed a tab you didn't mean to (for example by clicking on your mouse wheel while above a tab). As soon as you do, Mozilla Firefox reopens the last tab you closed; if you closed multiple tabs since you last launched Firefox, you will be able to run that command as many times as you closed tabs! Try it: right-click again on any open tab, and see if you see the Undo Close Tab command visible inside the context menu. 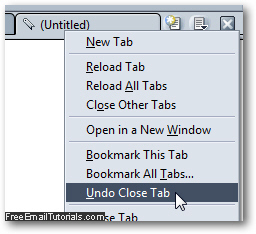 Firefox Tip: If you have configure the Firefox web browser to automatically reload all websites you had opened the last time you used your web browser, this setting comes with a nice side effect, and allows you to "Undo Close Tab" even if you have exited Firefox in the meantime. Again, this is not guaranteed to work, since it depends on which startup settings you have customized for yourself. Mozilla Firefox also includes a special command that allows you to reopen all closed tabs in just a few clicks. If you want to see individually the list of tabs Firefox remembers you closed, just click on the "History" menu, and go to "Recently Closed Tabs". That submenu includes the web page titles and icons of websites you closed, all as clickable menu items. Just click on any of them, and Firefox will reopen that particular tab, without affecting your currently opened tabs or other closed tabs. To reopen all tabs you have closed, just click on "Restore All Tabs" inside that same submenu! Mozilla Firefox will reopen all these tabs, which may take a while depending on the number of closed tabs you had, and the speed of your internet connection. And this is all it takes to reopen an individual closed tab, either the last one you closed, or another from the list of Recently Closed Tabs, and how you can reopen all closed tabs in Firefox with a couple of clicks!